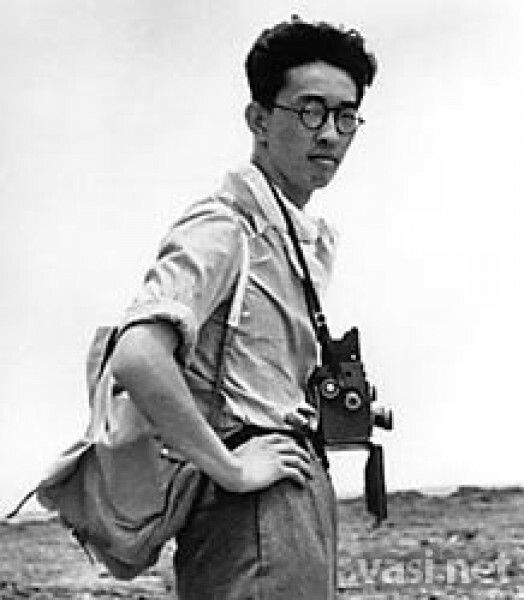 Yamahata Yosuke was 22 years old when he started working as a military photographer, documenting the Japanese army progression in Asia, but he returned to Japan in 1942. 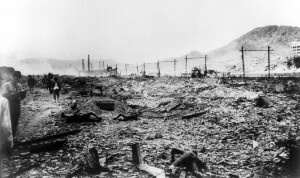 On 9 August, immediately after the detonation of the plutonium bomb over Nagasaki, Yamahata (still on military duty, working for the Japanese News and Information Bureau’s Western Army Corps in Hakata, Fukuoka prefecture, 160 kilometers north of Nagasaki) was rushed to Nagasaki by train. Along with Eiji Yamada, a painter, and correspondent Jun Higashi, Yahamata arrived 12 hours later. The trio was assigned to record the destruction for military propaganda purposes. Yamahata began photographing early in the morning of 10 August, working for nearly eight hours with two cameras and taking 121 pictures altogether. However, as a result of problems during the development process, some of the images are blurry or dotted with black spots. The photographs appeared in public for the first time in the Mainichi Shimbun newspaper on 21 August. 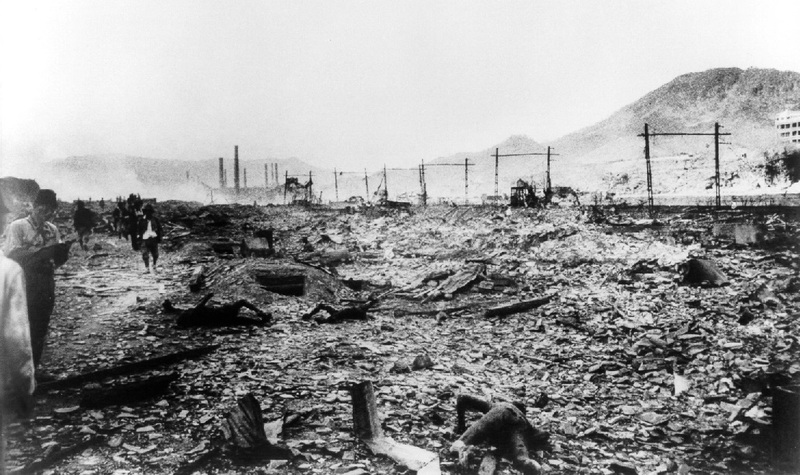 After the Allied Forces imposed strict restrictions on any form of report or coverage related to the atomic bombs, the pictures were not allowed to be published or circulated until the U.S. occupation ended in 1952. 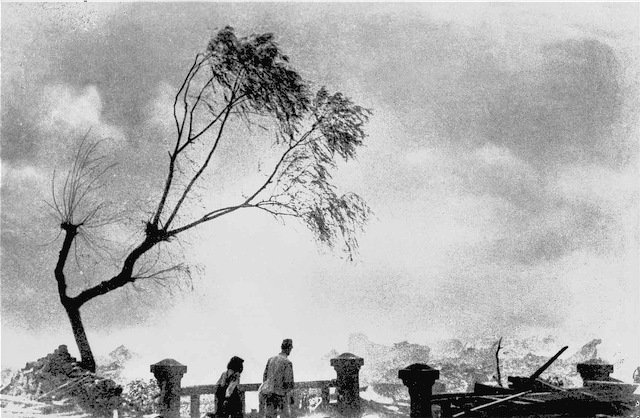 The pictures quickly appeared in Life magazine (9 Sep 1952) and were simultaneously published in Japan in book form. Edward Steichen then included several images in his legendary exhibition The Family of Man in 1955. In 1965, at the age of 48, Yamahata was diagnosed with cancer and died several months later. The images selected here offer two different perspectives of the scene of destruction. The first one, taken from above, barely exposes the details of the devastation, but it gives a good vantage point on the unfolding event: framed and overshadowed by the remnant branches and leaves of a willow tree that survived the horrific blast, which continues to smoulder. Onlookers are facing away from the camera/viewer, leaning over a banister and looking into the landscape of rubble, dust, smoke, broken and twisted wires and pipes, spraying water from a burst water main, looking into emptiness and nothingness and offering the viewer an introduction to the details of the obliteration revealed on the second image. The second image is much more informative than the first one, exposing some graphic, tangible details lying behind the opaque screen of light, smoke and dust of the first one. An examination of the details reveals the presence of charred bodies lying in the close foreground and stretching away towards the vanishing point of the picture, as if never ending. The train’s electric line forms a series of erected empty gates. Someone in the background is walking and watching with a white bandage around his arm. In the far distance, at the foot of the mountain, one can identify the remains of a modern building and the chimneys of an industrial complex close to the convergence area, blurred and distorted by the rising smoke. Only at the closer plane, standing on the left edge of the photograph, is someone attempting to register, to put order and logic, to categorize and give shape to the devastation-behind-words or imagination in front of us.